This ADA Shower Trailer +2 Station with Laundry Suite | Oahu Series features a clean designed interior complete with coordinating accents! 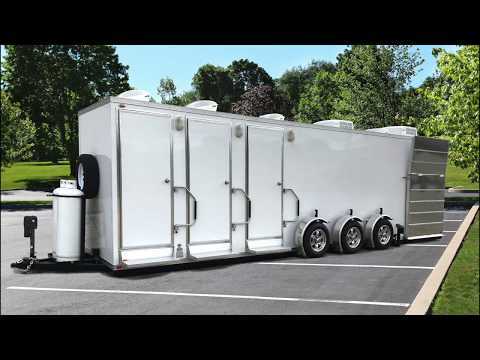 This shower trailer with laundry suite unit features 2 standard unisex shower suites, 1 ADA unisex shower suite, which can also be utilized as a family suite, and 1 laundry suite with 4 stackable washer/dryer units. Each standard unisex suite contains 1 pedal flush china toilet, shower stall, pedestal sink, and shatterproof mirror. The ADA-compliant unisex suite includes 1 wheelchair-accessible shower, sink, grab rails, and ADA toilet. *Photos are used to show choice of white or grey FRP walls and may not be actual representation of unit. Please see layout for actual representation.